Travelling in the spring or fall? There’s a good chance that lightweight waterproof coat that kept you bone-dry on those wet summer days isn’t going to get you comfortably through those chilly windy days & nights you’re bound to encounter. When your travels whisk you off to mild & cool destinations, there’s hardly a better addition to your travel gear arsenal than a solid softshell jacket. 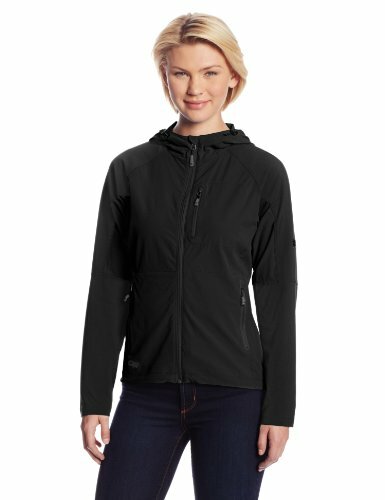 Choosing between the best softshell jackets for women, you’ll find outerwear that’s wind-resistant, water-resistant, stretchy, comfortable, and warm when it needs to be. Even if your travel career is limited, you’ve probably already realized that sometimes a regular rain shell just doesn’t cut it when traipsing around the world. Sooner or later, you’ll be flummoxed by a windy day or a chilly night that your lighter outerwear just isn’t equipped to handle. Softshell jackets are the perfect solution. These hybrids offer the warmth of a fleece jacket while providing wind protection and water-resistance (though not necessarily that next-level waterproofing found in top women’s rain jackets). They’re the perfect companion to shoulder season travel, bringing enough warmth to the table for cooler fall & spring days while still maintaining a modicum of breathability to keep things comfortable. Not to mention softshell jackets are insanely comfortable. The fabrics on softshells are soft to the touch and stretchy, providing great mobility that’s a boon for active travellers plowing down hiking trails or bouncing around cities. Looking to gear up your male travel buddy? Check out our guide to the best softshell jackets for men! 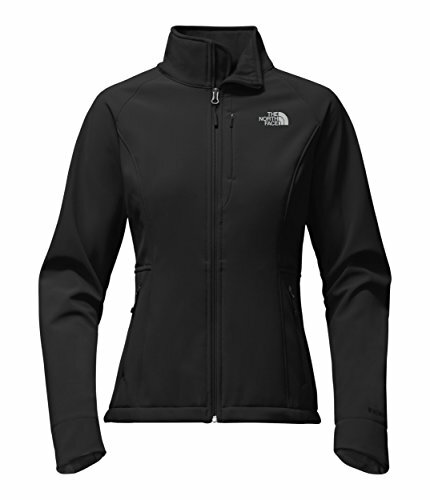 A long-standing favourite for travelling and for everyday wear, The North Face Women’s Apex Bionic 2 delivers a classic softshell jacket design with everything you need to stay comfy when the temperature start to dip. At the core of the jacket is TNF’s own WindWall® technology, featuring a fabric spun with polyester and elastane for a stretchy fit that wards off the windchill. It’s also treated with a durable water repellant finish that will see you through a light rain or snow without a hitch. The Apex Bionic 2’s soft fleece backer also adds an additional layer of warmth while cozying up nicely to the skin. Despite the added warmth, this jacket is quite breathable, allowing you to take the adrenaline up a notch without getting too clammy. This updated versions Apex Bionic 2 ditches the velcro cuffs of its predecessor in favour of an internal stretch cuff that still manages to keep the cold from rushing up the arm. They’ve also added a cinch cord in the hem of the jacket to further seal in the warmth. While the The North Face Women’s Apex Bionic 2 will suit most women just fine, the sizing can be a little snug on curvier frames. Consider ordering up a size, especially if you’re planning to layer it with a warm sweater. In need of a high-performance softshell jacket? 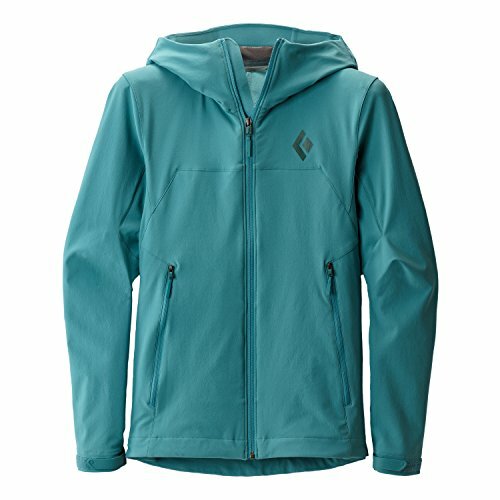 Look no further than the Arc’teryx Women’s Gamma MX Hoody. Like all of this Canadian company’s products, this softshell is designed with the needs of active travellers and athletes in mind. The result is a jacket that absolutely dominates whether your journey throws onto the mountainside or into an windy urban park. 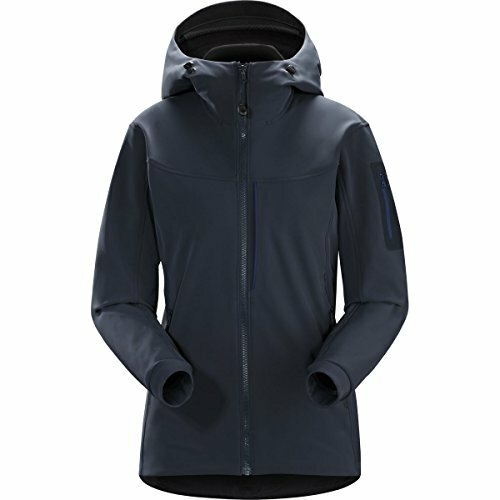 The Gamma MX Hoody Jacket builds around Arc’teryx’s own Fortius 2.0 fabric, made from a blend of polyester, nylon, and spandex. Besides its excellent breathability & wind-resistance, the jacket is designed for extreme mobility thanks, not only to the stretchy fabric, but to the gusseted underarms that allow for an extended free range of movement that other softshells only dream of. Even with the needs of athletes pushing the pedal to the metal in mind, the Arc’teryx Gamma MX Hoody slots in as the company’s warmest softshell. A lightweight fleece backer throws an additional layer of warmth and comfort while other features like a fleece-lined collar, adjustable hem, and stretch cuffs ensure that the nasty weather doesn’t hamper your plans. The biggest downside of the Arc’teryx Gamma MX Hoody is that all off its superb technology won’t come cheap. This softshell jacket sits as the most expensive on our list, but if high performance for adrenaline-pumping activities is what you need, it can’t be beat. Hiking in the wild only gets easier when you don the Outdoor Research Ferrosi Hoody. 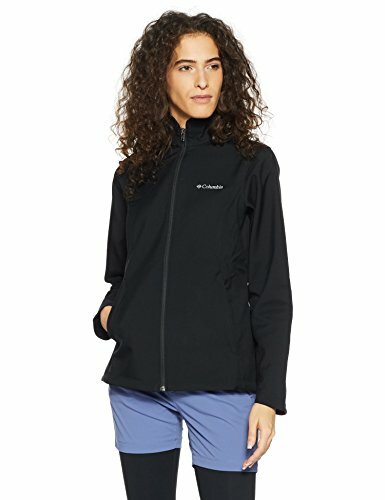 Among these top women’s softshell jackets, the Ferrosi not only offers some of the best overall performance, but some of the best abrasion resistance thanks for its tough Cordura reinforcements on the shoulders and forearms. The stretchy blend of nylon and spandex on the Outdoor Research Ferrosi Hoody is perfect for staying active when the conditions are anything but predictable. It’s excellent at fending off windchill and light rain without leaving you too sweaty underneath. If there’s anything we could complain about—and with this softshell jacket it’s a real stretch (no pun intended! )—it’s that the sizing can be a little inconsistent for some wearers. For curvier women, the chest may be a little snug in the smaller sizes while moving up to a larger size will leave the sleeves hanging. Travellers who can’t seem to sit still will absolute love slipping on the Patagonia Women’s Adze Hoody. Designed to tackle cool & windy spring and fall days, this top softshell jacket features an innovative three-layer Polartec Windblock shell that’s durable and weather-resistant without the bulk. The inner lining of the Adze Hoody throws in a soft fleece that’s soft on the skin and wicks away moisture when you ramp up your outdoor cardio activities. For both warmth and comfort, this softshell jacket is among our favourites. Whether you’re wearing it as an outer shell or mid-layer under a hardshell jacket or rain shell, the Adze hits the nail on the head. 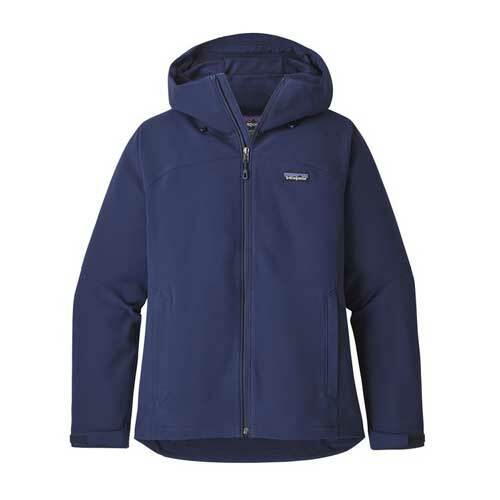 While the Patagonia Adze Hoody offers, overall, one of the top combinations of performance and value among our top picks for the best softshell jackets for women, it’s also one of the more expensive choices. For something that’s a little easier on the pocket book that’s still a great performer, The North Face Apex Bionic 2 is a solid alternative. Given the company’s reputation for superb value products, it should be no surprise that the Columbia Women’s Kruser Ridge Jacket is among the top choices for a budget-friendly softshell. While it won’t hold a candle to top-notch Arc’teryx or Patagonia jackets, the Kruser Ridge wriggles down to a fraction of the price that’s perfect for bolstering your travel budget. The Columbia Kruser Ridge does exactly what you need a softshell jacket to do. No more, no less. It features a 100% polyester shell that’s (mostly) wind- and water-resistant. Even without spandex or elastane thrown into the blend, the fabric remains stretchy and allows for a excellent range of motion, even better than some jackets that are twice the price. Of course, at this low of a price range you’re bound to encounter a few flaws. In terms of performance, the Columbia Women’s Kruser Ridge doesn’t offer the best all-weather protection in the bunch. Softshell jackets like the Patagonia Adze and TNF Apex Bionic, for example, both offer better resistance to wind and water than the Kruser Ridge. If you’re looking for a lightweight softshell that doesn’t break the bank though, you’d hardly do better than stuffing one of these into your rucksack. 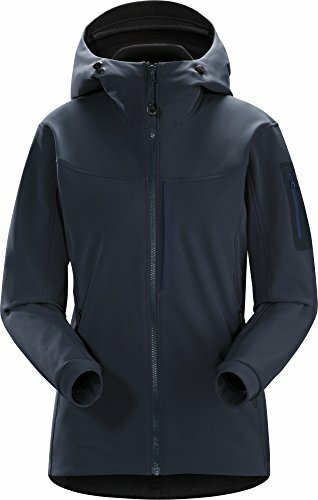 Without a doubt one of the top softshells for active travellers, the Rab Women’s Upslope Jacket holds true to this British company’s reputation among climbers and other adventure junkies with this mid-weight jacket. Built around Rab’s own two-layer Matrix fabric, this top-end softshell is designed to enable free movement while sticking it to changing weather conditions. The Rab Upslope pushes softshell jackets to their limit with a high-gauge knit backer that provides extra warmth on the pistes and mountainsides. Other features like a helmet-compatible hood, velcro-adjustable cuffss, and an adjustable drawcord hem prove how serious this jacket is about keeping out the elements. If we have any gripe about the Upslope it’s that it might be a little too much jacket for the average traveller. At 660 grams, it’s heaviest out of all our picks. For active pursuits that require that extra bit of protection though, you’ll be thankful for bringing this top softshell along. When you need to stand up to the elements during high-impact activities in cool windy weather, donning the Black Diamond Women’s Dawn Patrol Shell is never a bad idea. Fitted with a four-way stretch fabric, this top-notch softshell jacket provides the movement you need whether it’s to rip down the slopes or march through the city in search of cultural treasures. Where the Dawn Patrol Shell truly shines though is in its weather protection. The durable water repellant on the face fabric is perfect for shedding off a little light rain and snow while the jacket itself offers a fantastic combination of wind protection, warmth, and breathability when you start working up a sweat. And despite its composure on the slopes, the Black Diamond Dawn Patrol Shell is the lightest jacket among the highest-performance softshells. This, of course, tags a few bucks onto the price, truthfully, one of the only real downsides to picking one up for yourself. Looking for an all-around performer? 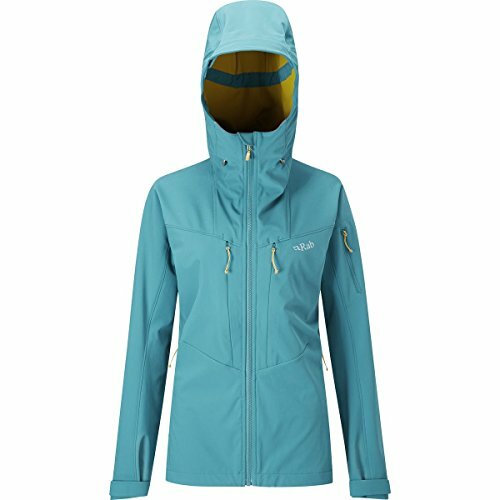 The Patagonia Women’s Adze Hoody and The North Face Women’s Apex Bionic 2 are our two top overall picks for the best women’s softshell jackets. Need a high-performance softshell for high-octane outdoor activities? You can’t go wrong with the Arc’teryx Gamma MX Hoody. Looking for a softshell that won’t break the bank? Even despite its performance flaws, the Columbia Kruser Ridge provides the best value for its price range out of any of these top women’s softshell jackets.